Boeing finalised an order for three 787 Dreamliners to Israeli carrier El Al and inked a memorandum of understanding with leasing company Air Lease Corporation for 12 737 MAXs, while Airbus announced US$1.5 billion in orders for Hungarian budget carrier Wizz Air and Portuguese charter airline Hi Fly. Away from the order books, Airbus and Boeing are targeting the service and maintenance market as a means of boosting business, with the global fleet of planes on course to double by 2036. Boeing values global demand for aerospace services at US$2.6 trillion over the next 10 years. Europe and North America are expected to remain the biggest markets, but the fastest growth is set to come in Asia, where demand for new planes is booming. The US giant predicts the global aviation support market - which includes maintenance, engineering, training and information services and analytics - will be worth some US$8.5 trillion between 2017 and 2036. 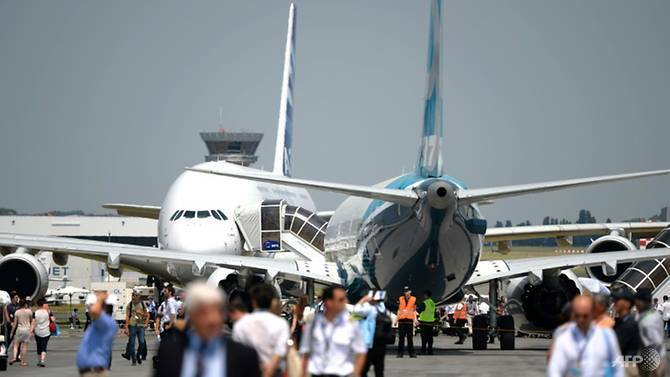 These services go alongside the massive growth in global air traffic and demand for new aircraft - Boeing estimates more than 41,000 planes will be needed in the next 20 years for an estimated US$6.05 trillion. Boeing said its customers are increasingly using technology and data to improve their business decision-making and passengers' travel experience. "It is clear that our customers, in both commercial and government sectors, are searching for more efficient ways to keep their fleets operating and ready for use in an age of rapid technological advancement," Stan Deal, president and CEO of Boeing Global services, said in a statement. "As commercial airline fleets continue to grow worldwide, demand for after-market services designed to increase efficiency and extend the economic lives of airplanes will follow." Boeing, which achieved a turnover of US$95 billion in 2016, announced the creation of a dedicated services division late last year, due to start operations on Jul 1. It has a 50 per cent share of the civil and military aviation market, but only seven to nine percent in services. Airbus estimates the services market will be worth US$3.2 trillion over the next 20 years, including US$1.85 trillion for maintenance alone. The European giant also announced plans to install new floating black box flight data recorders on its long-haul planes from 2019. Each plane will be equipped with two recorders, one fixed in the forward part of the aircraft and a second in the tail which could detach and float on the surface if the plane crashes in the sea. This would help avoid a repeat of Malaysian Airlines flight MH370, which disappeared en route from Kuala Lumpur to Beijing in March 2014 with 239 people on board and has never been found, despite a huge search in the Indian Ocean.